Papa won't let me feed him with flavored drinks. but he wasn't around. so, let him drink it. haha. thre is the face of a naughty boy. earlier this semester, we were given with an assignment in which we have to finish it by today. it was a research paper. we have to conduct interviews, collect data and finalize the findings with appropriate conclusion. so our topic is "Why Fresh Graduates Remain Unemployed?". so our task is to conduct an interview to understand why this problem occurs. our respondents are employers and to get to them, wasn't that easy. i failed in getting some of the respondents. so she had to fake my interview and put anything that reliable. even though i didn't like that but i remained silent and carry on with the job. later, she gave me 3/4 pieces of handwritten paper on introduction and literature review. i thought i'll just have to type it but then she said i have to translate her work to English. ever wonder why translator got paid high? because it's not an easy thing to do. it's super duper crazy thing~!!!! it took me sometime to finish that and when it's finished, i needed to bring that paper to see the lecturer and get her approval. she was so angry at me because i didn't add up the literature review. i told her i didn't have much time to do that and she just went mad. she said that she have given me the work a long time ago. who is she? she was my group mate. i teamed up with 2 guys and a lioness. and then she threw some accusations she made to the other 2 guys. well, lady, watch your mouth coz that is soooo unfair~!!! they've done their part! they've contributed. even if it not that much, well at least appreciate them! i remained calm even after i found out that she copied and pasted my article and claimed that it was hers. fine~ whatever. when we reached the submission date which was actually last fortnight, i didn't sleep and eat. i targeted an A for the subject. and then, she strikes again~! she was assigned to do the findings. and then when she feels like she didn't know anything or how to do it, she made it half done and dumped it to me. she commanded me to finish it for her. wth~! i was totally upset. luckily, the other 2 males are supportive. so when the thing is done and submitted, i felt completely free. like a flying bird, i flew so high up in the air but then i was caught in a net. damn~!! the assignment needed to redo. homg~! u gotta be kiddin me. i have final exam and and some other assignments and i have to see that thing again? huh! i did my part and emailed her and went back home. this afternoon, something happened. i was baby siting my lil brother and then i found that there were 25 missed calls. the caller was her and the other male. i tried to call them back because the male told me that the assignment wasn't completed. well, what can i do? im home to help my mom do some catering and to attend the tahlil ceremony of my late abah. is that wrong? come on, babe. the 3 of u cant finish an assignment? or u just want me to be there and finish it all alone don't u? i didn't answer the call because i was busy and didn't realize an incoming call. so what did she do? she didn't answer my call and then updated her status saying how upset she is and all she wanted to do is to insult me. FINE~!!! DO ALL U WANNA DO. I HAD IT ENOUGH! period pain to me is the worst problem every months. i got headache, stomach ache, back pain and my mood swings. when it came, i just can't do anything. totally helpless. but, one fine day, i was browsing through the internet and i found the cure! wait, i didn't google the cure but i accidentally found it. i was having both back and stomach ache and so i decided to lie down with my laptop. i put the laptop on top of my stomach and straightened my back on my bed. after sometimes, i felt better. much better. and then only i know, the heat from my traditional laptop helped in easing the pain and the posture is very good for my back. haha! an excuse for me to lazing around when i'm period. LOL. 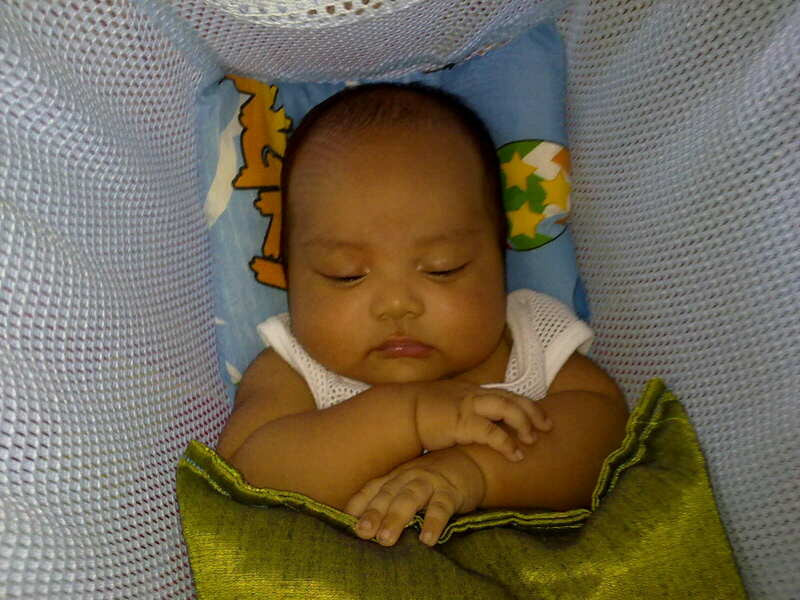 Baby Nooh sleeping like a boss~!! here's Baby Nooh strikes again! 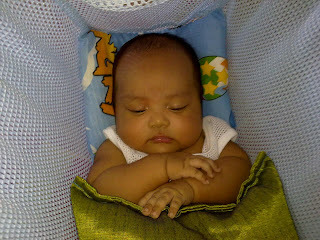 Baby Nooh: kak dena, baby wants to sleep... go away! LOL. Baby Nooh can now understands jokes n never stop drinking milk. homg, Baby, u're getting chubbier each day. 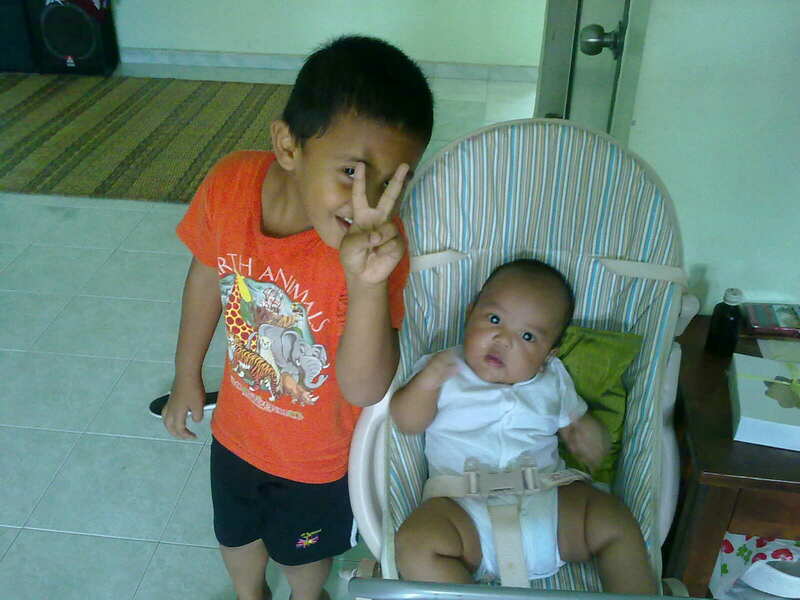 Baby Nooh: kak dena! Baby needs more milk! 2 little precious things in my life..